How chipsets are made can make a noticeable performance difference. Using the latest processor fabrication processes can mean thinner, faster and more power efficient smartphones for consumers as well as more design flexibility for manufacturers. MediaTek has long been a leader with respect to using cutting-edge processor technologies. Historically, processors perform better and have reduced power consumption if they’re built around a chip with incrementally smaller fabrication processes. This is due to the decrease in physical distance between transistors, transistor gate size, and the amount of current required to switch the gate. As transistors get tinier and more tightly packed threshold and active voltages can be lowered, saving power. MediaTek is again joining with world leading foundry TSMC for 10nm technologies. TSMC is a long-term MediaTek technology partner, and a distinguished leader in developing and advancing process fabrication technologies. Its 10nm process node is based on the next generation of high performance, low power 3D FinFET transistor technology. The 10nm process provides a 50% die scaling with a balance of up to 20% speed gain or 40% power reduction over 16FF+, and provides “the highest density in the industry today in contact pitch,” according to TSMC. The MediaTek Helio X30 product family provides users with cutting edge features, performance and power efficiency benefits in halo smartphone products. Among the 16/14nm class of products is a new 12nm technology from TSMC, which is used by the MediaTek Helio P30 product family. 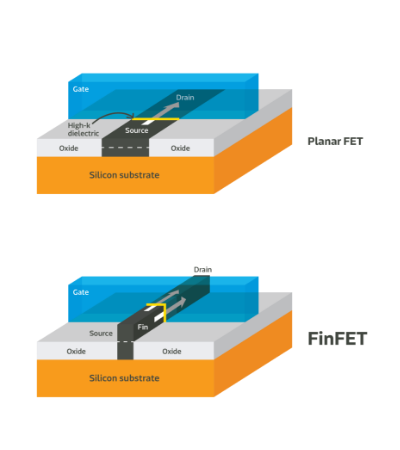 12nm FinFET Compact Technology (12FFC) drives gate density to the maximum and provides the best performance among the industry's 16/14nm-class offerings. Compared to TSMC's 20nm SoC process, its 16/12nm class is 50% faster and consumes 60% less power at the same speed. MediaTek also uses TSMC’s advanced 16nm FinFET technologies in its products. This again allows us to bring a highly integrated feature set, with incredible performance and power efficiency into devices. This includes up to 65% higher performance compared to 28HPM technology, or reduces power leakage by 30-50% while maintaining the same performance. The MediaTek Helio P20 family benefits from the 16nm FinFET+ advantage to bring slim yet high performance and feature filled smartphones to reality. TSMC 20nm process is the smallest, commercially viable planar transistor process currently available, yielding all the cost benefits of developing ‘traditional’ 2D transistors, while still offering great power efficiency, and performance. The MediaTek Helio X20 family taps this process to generate the world’s first Tri-cluster processors products, with advanced, highly-integrated features that continue to provide an incredible Android smartphone experience. The 20nm process technology yields 1.9 times the density, up to 25% less power and up to 30% higher performance than 28nm technologies. For volume Android smartphone products, MediaTek has developed a range of entry-through-mainstream smartphone products that use a variety of the cost efficient, yet high performance 28nm processes offered by TSMC. Depending on the intended application requirements, these include specially tailored processes for power efficiency, performance and cost efficiency.